The Twin Lakes are two lakes in the Mammoth Lakes Basin. The two lakes are connected by Twin Falls, which plummets into the second of the pair – Upper Twin Lake. Hikes in the region lead to Panorama Dome, Twin Falls, Hole in the Wall, and Valley View. The Twin Lakes are two lakes connected by the beautiful Twin Falls. 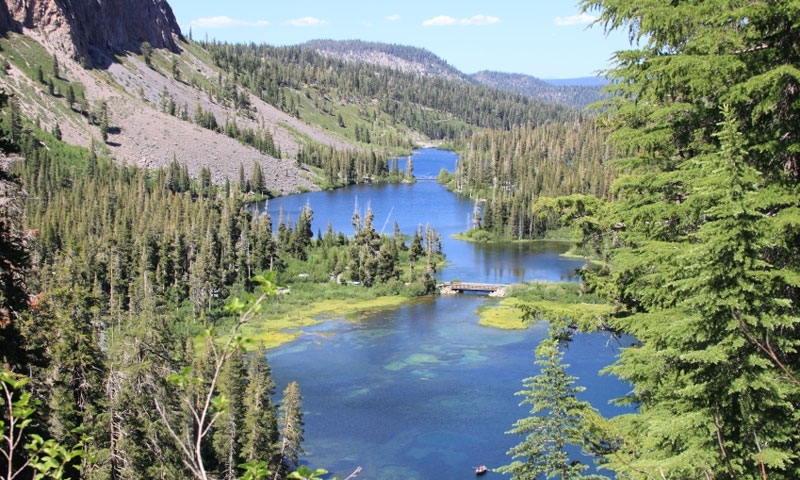 The area around Twin Lakes is full of stunning scenery and amazing hiking trails that lead to various interesting spots in the Mammoth Lakes Basin, including Panorama Dome, Twin Falls, Hole in the Wall, and Valley View. The Tamarack Lodge is another popular destination in the vicinity of Twin Lakes. The Twin Lakes are unique in this part of California – from above they almost look like they are joined at the hip – hence the name. The two lakes are connected by more than just a waterfall – a small bridge also unites the two together for visitors wanting to see the lakes from a different vantage point. There are many pleasurable activities you can enjoy here. Rent a rowboat or canoe and scoot across the lakes with your kids, or go fishing with a beautiful waterfall falling in the distance. Take a camping trip or just come for a day of outdoor fun.